Three wheels across the Himalaya: Cycling in the Afghan Wakhan – Is there a road somewhere? 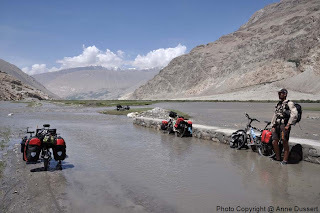 Cycling in the Afghan Wakhan – Is there a road somewhere? It took us almost 4 days to cover the 140km between the small village of Wazed where we had ended the trek at the foot of the Big Pamir and the border town of Ishkashim. After just a few kms, we encounter our first big river crossing. The boys go ahead to scout it out. It seems to be OK. Céline dives in, water up to her chest. I start crossing and end up both feet stuck in several inches of thick mud, water up to my waist, a tiny bit stressful! After a few trips back and forth, we manage to get all the stuff across. I keep my helmet on, you never know what can happen these days! No tarmac anywhere of course. The “road” often disappears under water, mud, sand or the occasionnal landslide. When there’s no mud or sand, there are rocks. The small streams or mud puddles that come before each sandy part are the worst… The transmission and brakes squeak and screech. I’m glad I don’t have rim brakes ! That looks hard work ! At some point, the road is cut off: a bridge is under construction. Good thing some Afghan workers give me a hand to go across. Stay focused. And don't look down! Everywhere we stop, it seems like we are the attraction of the day, especially near schools. People always love trying the tricycle. I told you it was super comfortable ! supper grazzy action in my opinion.It must be really good adventure.Nice photo nice people nice countryside....congratulation good performance.